H1Z1 has a storied history since its early access launch in 2015. 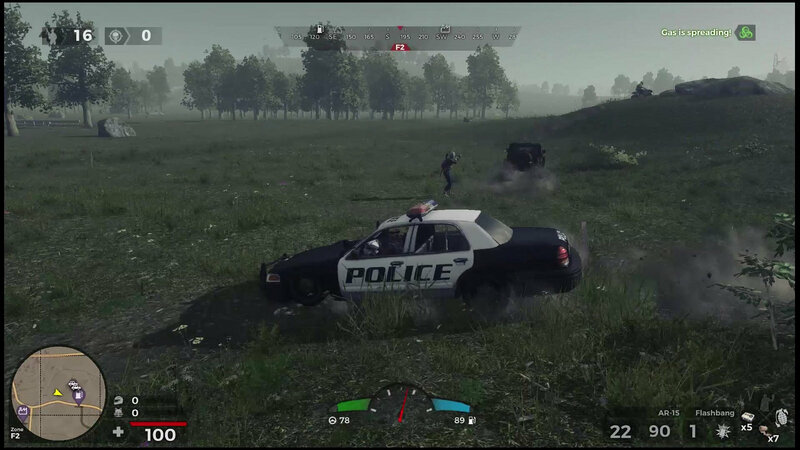 Originally a zombie survival game, the project was split into two different titles in February 2016, H1Z1: King of the Kill and H1Z1: Just Survive. 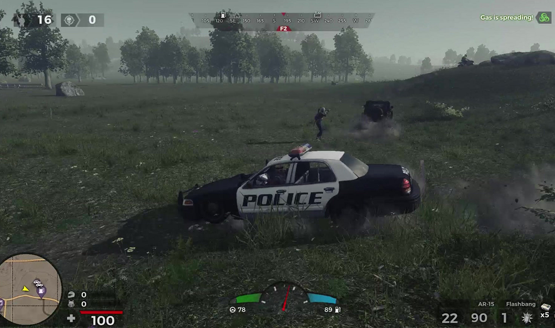 The former was a battle royale game, while Just Survive retained the zombie survival game that made up the original concept. Console development was put on hold, and for many, it appeared that we’d never see a full release of the game, or games, rather. Eventually, H1Z1: Just Survive dropped the H1Z1 branding, now called Just Survive. King of the Kill was rebranded back to H1Z1, and then H1Z1: Battle Royale, likely to keep brand awareness around other popular battle royale games like Fortnite and PUBG. The last-man-standing battle royale genre of games was first popularized by PlayerUnknown’s Battlegrounds, known as PUBG. Before PlayerUnknown himself—Brendan Greene—made PUBG, he was a consultant on H1Z1. In many ways, H1Z1: Battle Royale is the original battle royale game, and it’s finally available as a full release on PS4. That said, this is battle royale through and through. It’s right there in the name. If there’s some aversion to the 100-player free-for-all mode, H1Z1: Battle Royale isn’t going to do anything to change your mind. What is H1Z1 Battle Royale? For the uninitiated, battle royale pits up to 100 players against each other on a massive map. They drop in, find a zone, and scrounge for supplies. The safe zone on the map grows progressively smaller, forcing combatants together until only one is left standing. You can also play duos, which pairs you up with one other person, or fives, which you can probably figure out from the name. Matchmaking is available, so even if you don’t have friends to play with, you can be paired up with other people who would rather play as a team. Luck plays a large part in how well you do. H1Z1 doesn’t let you pick where to drop in, so as you parachute in, you have limited choice in where to land based upon where the game spawned you. Maybe you’ll land near a cluster of buildings where you can instantly be geared up and ready for any fight. Maybe you’ll just land in the middle of nowhere with not a piece of gear in sight. You could also happen upon a nice crate of high quality weapons, quickly getting the advantage in any encounter. This is all part of the fun of the game, of course. Vehicles can help you get around the map faster to scout for more gear, but they also increase your visibility to opponents. It’s entirely possible to succeed without finding that high-quality gear. Battle royale is as much about survival as it is combat, which means that it’s an entirely viable strategy to simply hide and stay out of combat. It’s often easier to reach higher positions this way, rather than risking death by seeking out encounters with opponents. A number of times I felt that the game was just unfair in combat situations. When I had the drop on someone and began shooting them before they even saw me, they would turn and quickly eliminate me. I may not be great at these types of games, but I know when I have someone dead to rights. Some of this is due to the jarring switch from third-person to first-person whenever you aim down sights with any gun. It needs to decide whether it wants to be a first or third-person shooter. Despite years in development and early access, H1Z1: Battle Royale is far from the best looking game on the console. Pitted against some of the PS4’s graphical powerhouses, it looks downright like a last-gen game. There’s lots of visual pop-in, from textures and objects in the environment, to players’ clothes and gear in the staging area. Yup, everyone in matchmaking looks like a naked headless person for a few seconds until all of the gear decides to load in. The color palette is washed out, with the typical military-shooter drab browns, dull greens, and grays. 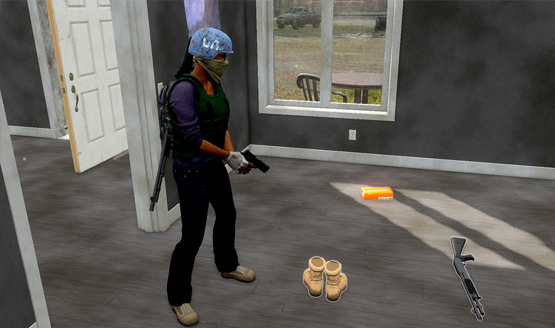 Remnants of the zombie survival game it once was can be seen in the abandoned and militarized environment, but that once interesting premise is now held in another game. H1Z1: Battle Royale is only battle royale. All together, these elements make the core gameplay loop grow pretty dull pretty quickly. Maybe the battle royale game type just isn’t for me, though I can see the potential in it. Reaching higher placement often felt like it was at either the mercy of unfair gameplay systems, or the boring task of hiding out and staying within the safe zone boundaries. Each match lasts around ten minutes (depending on a number of factors, obviously) and usually the first eight minutes of that are slow and quiet, while the match ends with a bullet to the brain from someone you can’t even see. After the first few matches, I found thorough exploration to be pointless. There were never any high-quality weapons squirreled away in buildings. It was a matter of grabbing the same couple of basic firearms tossed about and then either playing that hiding strategy or attempting to pick a fight. Better gear found in military crates sends a beacon of light into the sky, so rushing for that is just asking to get shot by the sniper camping it out. Again, that’s just battle royale for you. To me, it will always feel more like a game mode than grounds for an entire standalone game (the Trophy list supports this by not actually giving the game a Platinum trophy to earn). It will be interesting to see how these types of games survive when AAA developers start including battle royale as a game mode in their game, starting with the biggest military shooters later this year. The grind is entirely for visual customizations for your character, with a Battle Pass offering premium items as you level up. Whether you buy into it or not, everyone stays on an even playing field. The people who pay just look better while doing it. Either the gameplay loop itself needs to be buttoned up a little bit, or progression needs to be increased so that repeat play feels more rewarding. I get that the game is trying to entice you to pay money into it. That’s the free-to-play model after all, but at a certain point it’s not even enticing to pay money and I find myself wanting to stop playing any further. As someone who never played the PC version of the game, I can’t speak directly to the console quality-of-life adjustments that have been made. I can say that nothing feels overly awkward or cumbersome, which is a relief. It seems that most PC-centered games that get ported to console suffer from menus and inputs designed for keyboard and mouse. H1Z1 on consoles is all about the gameplay first and foremost, and I never worried about inventory management in the middle of the fray. While H1Z1: Battle Royale doesn’t do anything particularly special yet, it sets up a solid foundation that can be expanded with future events and additions, a la Fortnite. It earns its battle royale name, but never tries to stand above the rest of the crowd, instead opting to play it safe with the basics. Without knowing if or when PUBG might come to PS4, H1Z1: Battle Royale gives players an ample replacement if they’d rather not get into Fortnite. Daybreak just needs to start hosting some interesting events and updates in order to keep players hooked and interested going forward. I wouldn’t say no to a little bit of work on those visuals either. Until then, I think I’ll just go watch the movie that inspired this whole gaming trend. H1Z1: Battle Royale review done using the free-to-play game. Battle Pass provided by developer, which only awards cosmetic upgrades on leveling up. Version 1.32 reviewed on a standard PS4. For more information on scoring please see our Review Policy here.